There’s a rare 1943 penny worth $85,000 – do you have it? Most rare pennies are valuable, but few rare coins even come close to rivaling this old 1943 penny worth 6 figures! Here’s the scoop on the 1943 copper penny — including how to tell if you’ve found one and how you can spot other rare pennies in your pocket change, too. Is The Rare 1943 Penny Worth $85,000… Really? Yes, a copper 1943 penny really is worth an average of $85,000. Believe it or not, some are worth much more than that! For example, one 1943-D copper penny commanded a whopping $1.7 million when it sold at an auction in 2010. Other 1943 copper pennies routinely sell for $100,000 to $200,000. That sure is a lot of money for an old penny, right? But why was the copper 1943 penny even made in the first place? It’s actually one of the most valuable mistakes the United States Mint ever made. The copper 1943 penny is a type of error coin that was born when a couple dozen (or so) bronze 1942 penny planchets were mistakenly left in the hoppers at the Philadelphia, Denver, and San Francisco Mints. These bronze planchets were fed through the machines without notice and were struck with 1943 penny dies, thus creating the rare and valuable 1943 copper penny. 1943 copper pennies were first discovered in 1944, and several more turned up in later years. The coin has always been a hit with coin collectors, commanding thousands of dollars even as early as the 1950s. Finding a 1943 copper penny isn’t easy. So few of them exist, yet almost all of the 1943 copper pennies we know of today were originally found in pocket change. In fact, the first known 1943 copper penny was discovered by Kenneth Wing, a teenaged coin collector who found the coin in circulation back in 1944. 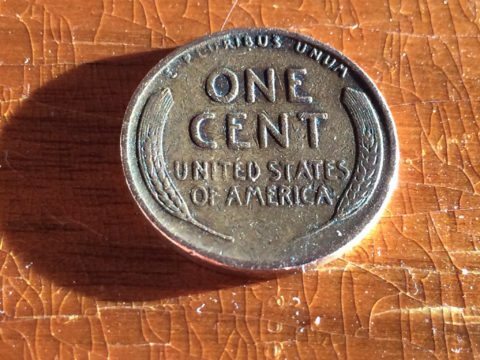 Today, you can still potentially find a rare 1943 copper penny in pocket change. But it could take years upon years of searching each and every one-cent coin that goes through your spare change — not to mention searching through bank rolls and possibly expanding the search to include estate collections. You also have to be careful to watch for fake 1943 copper pennies. There are far more fake ones out there than there are real 1943 copper pennies. When news of the 1943 copper penny arose in the 1940s and 1950s, the inevitable happened: people started copper-plating their regular 1943 steel pennies to pretend they had the real McCoy – or worse, to pass off to others as genuine. Sticks to a magnet – if your 1943 penny does stick to a magnet, it’s really made from steel and is not rare. Weighs less than 3 grams – 1943 copper pennies weigh about 3.11 grams, while the 1943 steel penny weighs 2.7 grams. If your 1943 copper penny doesn’t weigh at least 3 grams, it’s most likely a steel cent. Has a date that doesn’t look right – Maybe your 1943 copper penny weighs about 3 grams and doesn’t stick to a magnet, but is it really an authentic 1943 copper penny? It may actually be a 1945, 1948, or 1949 copper penny with a retooled date. The “3” on 1943 copper pennies should have the unusually long tail, just like that on any 1943 steel cent. If you have a 1943 penny that seems to match the requirements listed above, congratulations! You may very well have a coin that’s worth $85,000 — or even more. But what do you do with this coin? You can’t just turn it in at the bank and walk out with $85,000 in cash. You’ll need to get your coin certified by a 3rd-party coin authentication firm! Nobody is going to pay you $85,000 or more for a coin that isn’t officially certified as authentic. That’s just not the way the rare coin business works. Both have been around since the 1980s and have certified millions of coins. Some of the biggest coin auction firms in the world rely on the expertise of PCGS and NGC for grading, authenticating, and certifying rare coins. How do you cash in your certified rare 1943 penny? Sell it to a coin dealer! There are many great coin dealers, and they can help you determine if it’s better to sell the coin directly to them or through an auction house. In addition to the 1943 copper penny, there are dozens of other rare and valuable pennies you can find in pocket change! Among these are the 1944 steel penny — which is a reverse error of the 1943 copper penny. A few 1943 steel cent planchets were mistakenly left in the presses at the beginning of 1944, the year the Mint was supposed to make copper pennies. 1944 steel pennies are worth about $75,000 or more. And that’s just for starters…There are at least 43 valuable pennies you should be looking for! See the full list of rare and valuable pennies. Have A Silver Penny That’s Not A 1943 Steel Cent?